With funding from the German ministry of Agriculture a new position to support the GODAN (Global Open Data in Agriculture and Nutrition) Secretariat has been created. 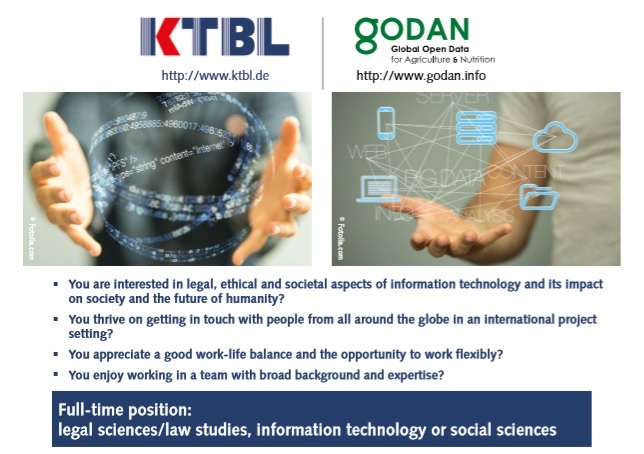 Are you interested in legal, ethical and societal aspects of information technology and its impact on society and the future of humanity? Do you thrive on getting in touch with people from all around the globe in an international project setting? Do you appreciate a good work-life balance and the opportunity to work flexibly? Do you enjoy working in a team with broad background and expertise? within a project to support the Secretariat of the GODAN Initiative. The post will examine questions of data ownership and responsible use of data in the context of open data and open access. The position will be located at KTBL (Kuratorium fuer Technik and Bauwesen in der Landwirtschaft) in Darmstadt. It will focus on issues of data rights and data ownership. Have a look at the job announcement (attached).